This type of forest occurs along with the Dry Deciduous Mixed Forest and Sal forest. The extent of this forest type is very small. 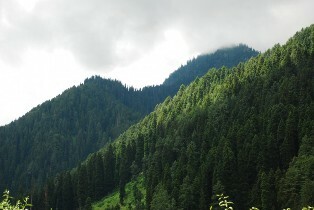 Chir (Pinus roxburghii) occurs on the higher slopes of the Shivaliks, mixed with stunted Sal forests. The other associates of this pine are Anogeissus latifolia, Terminalia alata, Buchanania lanzan, Terminalia bellerica, Ssteriospermum suaveolens, Ougeinia oojeinensis, Grewia elastic, Nyctanthes arvor-tristis, Mallotus philippensis etc, The undergrowth is generally poor, consisting mainly of Carissa opaca, Zizyphus xylopyra, Woodfordia fruticosa, Indigofera cassioides, Tephrosia candida, Colebrookia oppositifolia, etc. The common grasses are Eulaliopses binata Chrysopogon fulvus, Andropogon controtus, etc. An exhaustive list of trees, shrub, herbs, climbers, and grasses has been listed as an annexure to the Management Plan. Out of all the tree species found in the park, none could be more important than the fruit bearing trees because a large number of animals, #birds and insects depend on them for survival. Write A Comment/Share information for this page. We will add all necessary information in this page related to flora of Rajaji National Park with your name.